Antique Pewter, Victorian Style, Rollerball Pen. 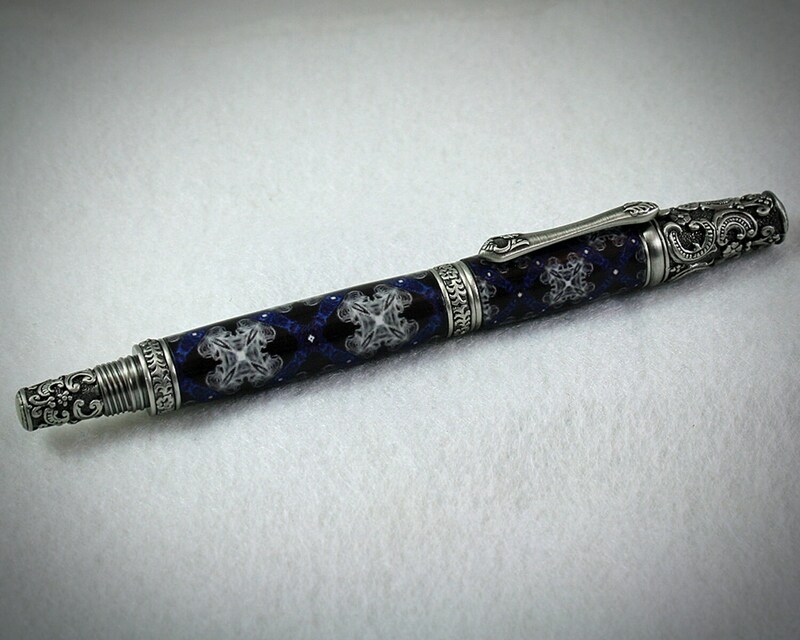 This is a beautiful, high-quality rollerball pen with Victorian Era styling. This distinctive art form was born in England during the reign of Queen Victoria (1837 - 1901). +The pen that is pictured is the pen the buyer will receive. +This unique pen accepts a standard ceramic rollerball refill, commonly known as a Schmidt 888 rollerball refill. Length4.34” (11.5cm) Diameter .248” (6.3mm). Ceramic rollerball refills are available wherever office supplies are sold. +Approximately 6.125" long when capped, 5.125" long when uncapped and 7" when posted. It is approximately 5/8" at it's widest point. +Weighs 2.7 ounces (77g) with cap, 1.4 ounces (39g) without the cap.